BEAR RIVER, N.S. -- Jon Welch stands beneath the crumbling concrete arch on a bridge spanning a river behind his coffee-roasting business and wonders aloud how much longer the structure can last. "When you get underneath and have a look, it makes you think twice about running a car over it," he says as the water rushes into the community of Bear River in southwestern Nova Scotia. He gestures to a curving bulge in the stacked stones that form the supporting end and adds, "It looks like it's been migrating out towards the water ... It looks worrisome to me." The bridge is one of about 240 bridges or culverts among 3,861 reports received by The Canadian Press that had a rating of poor or worse from inspectors' reports as of this summer. The province says bridges listed as "poor" are safe for traffic, but have advanced section loss, pieces of concrete falling off and structure worn away by water and sediment. Those considered "serious," a lower ranking than poor, have erosion and crumbling that affect primary structural components. The latest results received from a freedom of information request are an improvement since The Canadian Press reviewed a database of provincial bridge inspection reports for 2012, when 3,021 inspection reports said 391 of bridges -- or 13 per cent -- were in poor or worse shape. 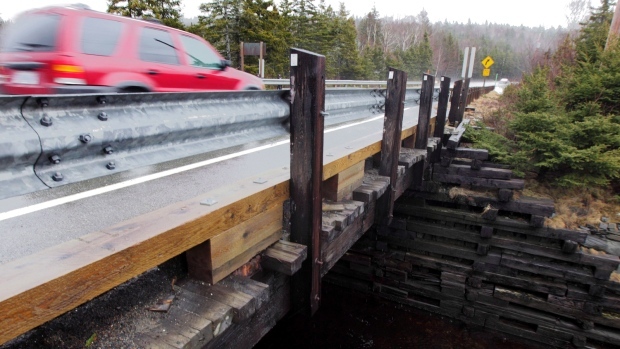 Still, the province's top bridge engineers aren't declaring victory as the roughly 4,100 bridges linking Nova Scotia's small communities continue to deteriorate in the coastal freeze-thaw cycle. Senior bridge engineer Will Crocker said during an interview about half of the bridges in the province are past their expected 50-year lifespan, forcing continuing repairs to keep them safe. Chief highway engineer Bruce Fitzner estimates the province's roads and bridges need an average of about $400 million a year over the next decade to arrest the "infrastructure deficit," - but that much money isn't available. "Our current budget for this year is $220 million for everything (roads and bridges). Theoretically every year you don't spend that $400 million your (infrastructure) deficit increases. That's the challenge," he said. The engineers say they have been trying various new repair methods, such as spraying structural foam between the stacked stones on the Bank Bridge in hope of holding back the shifts and bulges in the supporting structure. "We would continually monitor it (the Bank Bridge) until it gets to the point where we no longer felt comfortable it was solid or sound, then we would take action such as fixing it or reduce the weight limits on it or some other measure," said Fitzner, adding the Bear River span is on the replacement list for 2020. There are many competing projects and the cost is high even for small bridges on back roads, says Fitzner. For example, the Plaster Creek steel truss bridge in Cumberland County has new rails and concrete blocks to support deteriorating walls, but the inspector said last year "all existing piles are damaged for a metre above the streambed and splintering is occurring." The structure is just 3.4 metres long, but Crocker estimates the replacement cost is over $1 million due to new environmental regulations, more stringent building codes and stricter design requirements. Meanwhile, timber bridges around the province continue to rot, and photographs show the splintered and crushed supporting structures in graphic detail. The MacDonald Mill Brook bridge, located on a dirt road near the small community of Caledonia, has decaying girders and the abutments are rotting and bulging out. "Our recommendation would likely be just to close that bridge," said Fitzner, but he adds that suggestion is usually greeted by local opposition. The Prospect Road Overpass on the outskirts of Halifax remains listed in serious condition. Photographs show that bearings where the bridge spans connect with supporting pillars are deteriorating as the concrete beneath falls away. "We have such a backlog of bridges we need to do," says Fitzner. "The ones ahead of it need it quicker than that. Ideally we'd like to do it all sooner." He says he's just sent a proposal to treasury board to begin the replacement process for the overpass in two years. Yet with each approval, the competition among the many small bridges for replacement and repair continues. In Bear River, Welch reaches up and snaps off a small piece of a white crystaline deposit caused by water leaching through the concrete. "We were told a number of years ago this was a priority bridge, but I don't know what a priority is if it's in this state and people are still allowed to use it."